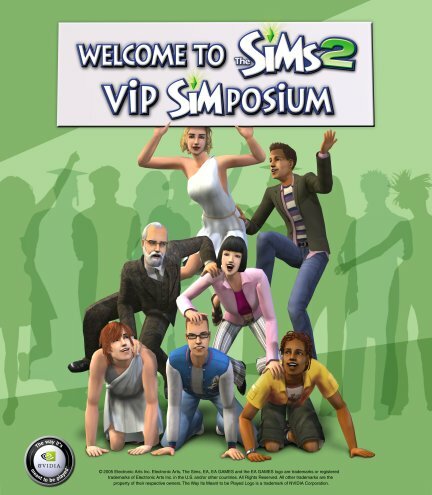 In February 2005 Maxis held an event sponsored by nVidia: the Sims 2 VIP SIMPosium. Maxoids, Sims fansite owners and game modders gathered in Redwood City. In this rather small city in Silicon Valley (and near San Francisco) the biggest game publisher in the world has its headquarters: EA. Since March 2004 Maxis has also been located at the Redwood Shores studios located on the EA Campus. The event was a source of lots of information regarding the Sims 2 University, the first expansion pack for the Sims 2, but the visitors also got the opportunity to talk to the team, give suggestions and tell the Maxoids what the Sims 2 players would like to see in the game. Of course the Sims Zone was there, and this is our special coverage of the event. Enjoy the read! Written at 21:20 on Wednesday 23 February 2005 by ChEeTaH.